There are secrets to baking light, moist and delicious muffins. Most recipes just tell you to put the ingredients together and mix. I’m telling you, you need a gentler hand. Preheat oven to 350o and line a standard muffin tin with paper liners. First, your wet ingredients shouldn’t exceed a total of two cups. 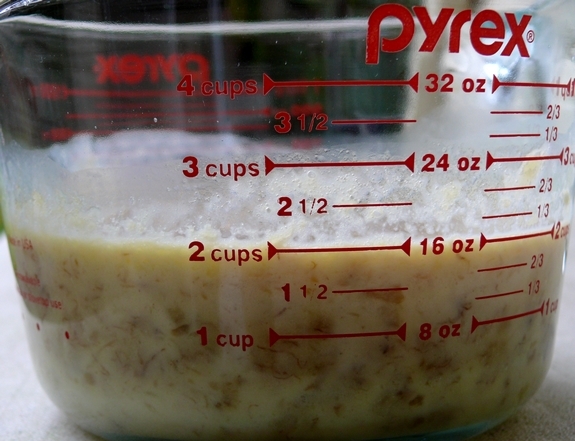 I use a 1 quart measuring cup when putting my wet ingredients together to keep track. Because bananas are different sizes, the addition of wet ingredients can vary, which is why I use the 1 quart cup for easy measurement. Mash your bananas well with a fork and place them into your measuring bowl. Add melted butter, vanilla, egg, coffee and enough milk to make a total of two cups. The addition of milk will only be enough to make a total of two cups of all the ingredients. Do not add more. 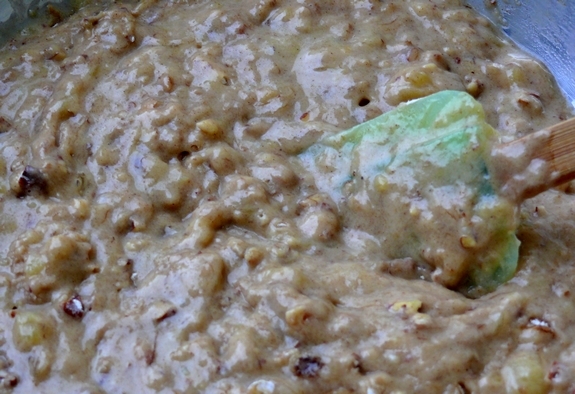 In a large bowl combine flour, sugar, salt, baking soda, baking powder, cinnamon, nutmeg and nuts. Now, add the wet ingredients to the dry ingredients and fold them very carefully into each other. Do not mix more than about 10 strokes. Overmixing is the death of baked goods. There might even be some dry spots of batter left and it will be lumpy. That is fine! If you mix until the batter is runny, your muffins will be average, and a little tough. Spoon the batter lightly into the muffin pan (do not pack it in). Now here’s what gives my muffins a yummy, sugary, crackly top. I sprinkle sugar (don’t be shy) over the tops and spray each with a sprits of cooking spray. It’s a simple technique that gives a nice, crunchy touch. Place into your preheated oven and bake for 20-24 minutes or until a toothpick comes out clean. Remove from pan and enjoy. They are so good when still warm! 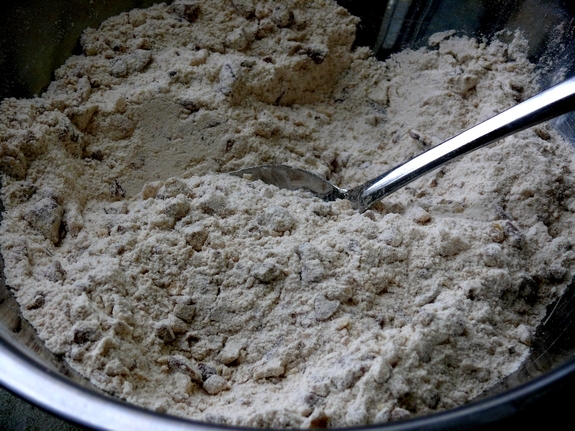 In a large bowl combine flour, sugar, salt, baking soda, baking powder, cinnamon, nutmeg and nuts. Now, add the wet ingredients to the dry ingredients and fold them very carefully into each other. Do not mix more than about 10 strokes. Overmixing is the death of baked goods. There might even be some dry spots of batter left and it will be lumpy. That is fine! 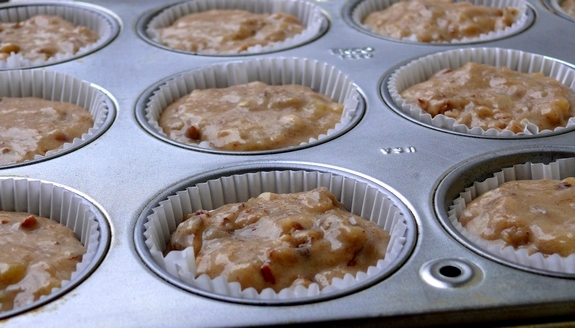 If you mix until the batter is runny, your muffins will be average, and a little tough. I love banana nut muffins. So going to make these. What a terrific blog you have! I subscribed to Noble Pig a couple of weeks ago and am so pleased with its content! Today’s tips on making muffins properly was an ‘ah-ha’ moment for me. And the recipes wonderful recipes just make me so happy! Seriously, I’d PAY for this blog! Oh, the fact that you bring your yummy food to those who are hungry is just frosting on the cake–tee-hee! 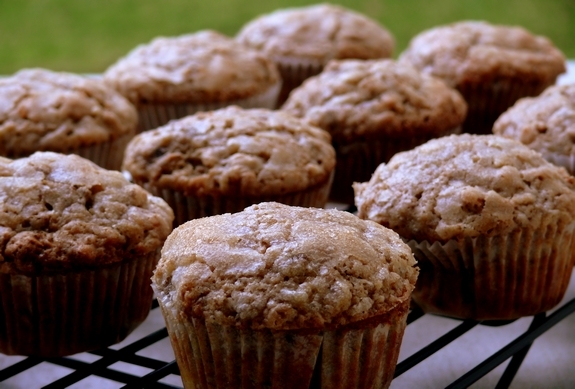 we love banana nut muffins and truly bake them at least once a week. Just printed out your recipe. First trip into the kitchen this morning to get a cuppa, three ripe bananas greeted me. 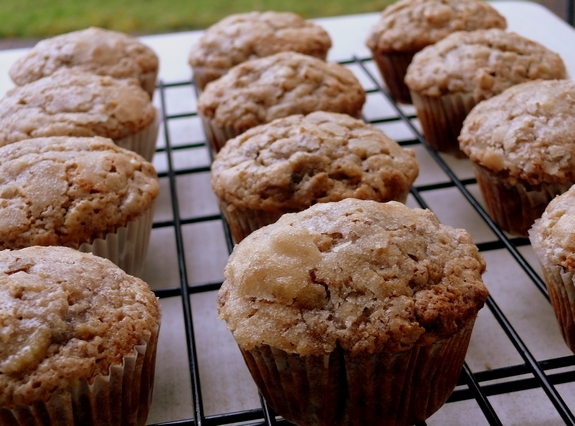 First trip to the RSS feeds I receive a recipe for Best Banana Nut Muffins. Guess what I am doing today. Thank you Cathy for the inspiration! That sounds like excellent advice. I probably add too much banana to my muffins. Thanks for the tips. I like the idea of the sugar/oil spray too! Sounds great – keep them coming! thanks for the tips! i loooove banana muffins. Great tip about the liquid measurement. NO one ever thought to tell me that before. I’ve often been disappointed with the banana breads I have made over the years. I think I would have been less so had I considered the liquid equation. I could go for some muffins right about now too! Some chocolate chips in here would also hit the spot. I always do my wet ingredients in the blender when I make banana or pumpkin muffins… my son has some texture aversions, so the fruit has to be completely incorporated or he won’t eat it. I’m going to remember the 2 cups bit, that’s very helpful! Planning to make these for breakfast! Thanks! Recipe title is accurate! I just made these and they are the most tender, delicious , and moist banana muffins I’ve ever baked. One hint would be to make sure to sift your flour. I nearly didn’t but thought about the comment above that indicated too much flour wouldn’t result in as good a product. Well, that was right! I measured carefully 3 C of flour (doubled recipe) and then decided to sift my flour and measure again. After remeasuring my 3 C flour, I was left with approximately 1 1/2 C still left in the first bowl! Lesson learned. Hardest part will be leaving some for the husband and son. Will be a holiday recipe for sure; so quick and easy to put together!!! Delicious muffins. Light, flavorful, satisfies the sweet, but not too sweet tooth and easy to make. Measuring the liquids is a wonderful tip for consistency! Have already made several times. Made these great muffins last night, finished baking around 8:30 pm. Tripled the batch and made 36 muffins AND a banana loaf. Well, in a house with 4 teens, all that remain after breakfast the next day are 10 muffins and the loaf! Taste test passed!! Thank you! !